‘There can be no denying the importance the Victorians placed on first impressions,’ says Robin Guild in his masterful guide to home repair and decoration, The Victorian House Book. ‘It is the entrance door which captures the eye of the visitor as he waits to be admitted.’ In keeping with this tradition, we have had our door freshly painted and enhanced by stained-glass panels featuring our eponymous sheldrakes. Over the course of a hundred years a house will fall into disrepair. Bricks crack and spall, cast-iron gutters and pipes spring leaks, windows rot and slates slide off roofs. With its leaded light construction, stained glass is particularly vulnerable, all too easily punched in by burglars and shaken loose by continual door slamming. Since repair can seem difficult, stained-glass panels are often chucked in the bin and replaced by wood or frosted glass of dubious design. A walk down many a Victorian street will confirm this sad decline. Householders need not be discouraged, however. The depredations of past decades can be made good by careful restoration. A Victorian house will always look its best when repaired in style. As Robin Guild says, you need to get the architecture right and then everything else follows. The front door at Sheldrake Press had lost its stained glass a long time ago. For at least 40 years the upper panels had been wood, and we knew they were not original because they were made of marine ply. You could see the tell-tale grain on the inside of the door, which had been stripped and varnished. As part of a programme of repair and restoration, we decided to reinstate stained glass using a design appropriate to an 1890s house. It would let more light into the front hall, as originally intended, while screening the interior from the street. Security could be ensured by the addition of clear panes of laminated glass. We decided to place them on the outside in order to protect the new stained glass from the wind and the rain that sweeps up from the south-west. 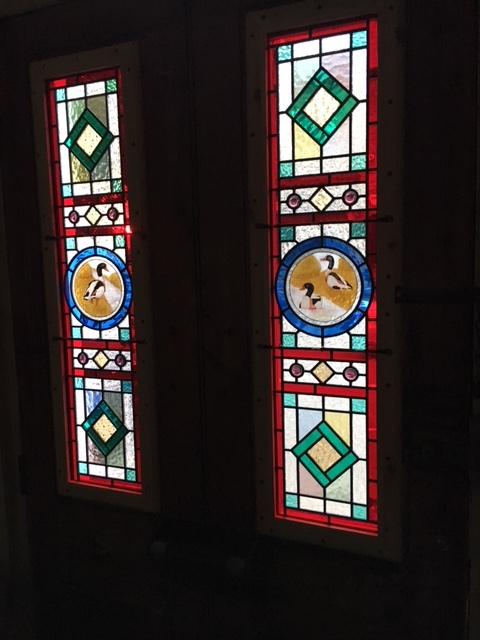 Our builder recommended a local stained glass studio run by Marc and Mary Eady, and having seen their designs, we commissioned them to create new panels that would be in keeping with other houses in our street. On one of his visits to study the door and measure the openings, Marc Eady was examining the beading that held the upper panels in place and discovered notches cut at intervals. ‘You definitely had stained glass,’ he confirmed. These notches would have accommodated the slim iron rods used to hold the stained glass in place. We had no pictures of the house showing the original stained glass so we decided to echo a design found in many local houses which consists of geometric patterns surrounding rustic motifs painted in a central roundel. The Victorians had a nostalgic love of the countryside and in the smogs and fogs of coal-burning London liked to display small illuminated glimpses of their agrarian past. 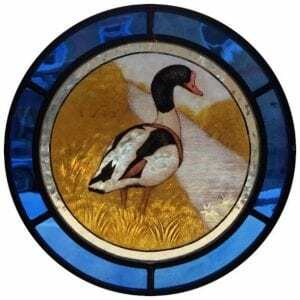 For the roundels on our door, the obvious scenes would be sheldrakes in their natural habitat of reed beds, though it took a friend to tell us this! Marc Eady researched some sheldrake references and engaged a stained glass artist to paint the scenes. Now in his eighties, he had spent his life painting memorial windows in English churches. While he was creating the central roundels, Marc and Mary started to prepare the rest of the panels. Working from sketches which we had approved, they turned to their sample boxes and selected a range of glass including original Victorian amber glass and coloured glass from Bohemia, Germany and the United States. A sheldrake stands on a river bank. Having laid the pieces out like a big jig-saw and added the completed roundels, they fitted the glass into lead carries which were cut, shaped and soldered into place. When the panels were ready, they covered both sides in a black putty-like cement, which they brushed under the lead work to form a waterproof seal. Adding whiting helped to dry the cement by absorbing the oils. Finally, the residual powder was brushed away using a dust extractor fan to capture the loose grains. Removing all the cement from glass that has an intaglio surface was no easy matter and the least pleasant part of the process, but when the glass emerged in brilliant clarity and the finished panel was held up to the light, the tediousness of the work was gloriously rewarded. When you have grown used to a door with blank wooden panels, the lift you get from stained glass is a revelation, especially at night. A visitor is greeted with a glowing tapestry of reds, greens and blues and the mysteriously screened promise of warmth, comfort and good cheer inside. Wherever stained glass is present, a walk down a Victorian street at night is like a free light show, a fête des lumières full of opulence and grandeur. The Victorian House Book is a practical guide to home repair and decoration which contains 2,000 pictures to guide the householder through any project, from making good the architectural fabric to choosing curtains and cushions.